This article first appeared in Village magazine. Perhaps the strangest event on the Irish media landscape last month was prompted by Sinn Féin MEP Lynn Boylan’s publication of a report into media ownership in Ireland, commissioned by the European United Left/Nordic Green Left (GUE/NGL) grouping in the European Parliament. “tiresome blog”. In traditional Sindo style. three of the five paragraphs Collins devoted to the story were spent slagging off Sinn Féin. There were some other straight news reports, from thejournal.ie and the Examiner. But apart from communications minister Denis Naughten being forced to admit he hadn’t read the report hours after he had dismissed its findings – effectively killing it as a news story, the report seemed destined to decline into obscurity, gathering dust and never to be mentioned again outside of an occasional retrospective the next time someone looked at the Irish media scene. And then, for some reason, Denis O’Brien decided to breathe life into the story, issuing an oddly rambling and misspelled statement: a series of barely connected paragraphs, jumping randomly from topic to topic. Aficionados will recognise the work of his earthly representative, James Morrissey. O’Brien’s statement, a series of barely connected paragraphs, jumping randomly from topic to topic, will look familiar to a great many copy-editors and sub-editors. It resembles nothing so much as the “celebrity column”, a series of disjointed observations and wisecracks hacked into a workable column by an overworked staff writer, and headed with the name of a minor sporting of entertainment “name”. It does land one pertinent early blow, pointing out that while the report identified RTÉ as also holding a dominant media position in Ireland, it devotes “no focus” to the broadcaster. This might give the impression that the entire report is devoted to O’Brien. This is not the case. For example. the authors devote 12 pages to a general consideration of the importance of media plurality (and how plurality differs from economic competition). In addition, the authors highlight not only O’Brien’s ownership of media outlets, but his propensity to go to the courts to protect his reputation, as having a chilling effect. The Report notes that since 2010, he has gone to court 21 times, 12 times against media outlets, once against a PR firm, twice against the Moriarty tribunal, once against Dáil Éireann, and once against an individual TD, Colm Keaveney. In addition, there were threats of legal action which were not followed up, such as that reported against satirical website the Waterford Whisperer. However, O’Brien soon tires of the RTÉ whataboutery, and returns to the topic of Sinn Féin “pushing its agendas, overtly and covertly”. To this end, he embarks on a rambling walk, stopping first to point out that An Phoblacht has criticised RTÉ, and then to defence Apple’s tax accounting practices, calling Sinn Féin’s criticism of their tax practices “anti-enterprise and anti-Irish”. O’Brien then regains his focus once more, fact-checking that he is not the chairperson of Communicorp, he just owns the company. But then his concentration seems to wander again, and he inadvertently makes the authors’ point for them. “Is the media objective when it is talking and writing about itself?” asks Denis (or perhaps his human avatar). Pausing to note that INM was “days from forced closure” in 2011, O’Brien then complains that RTÉ never contacted him for comment when Boylan’s report was published. Kevin Bakhurst, RTÉ’s deputy director-general and managing director of news and current affairs, was prompted in response to post on Twitter that the broadcaster “did ask for a response on the report and Denis O’Brien’s advisers chose not to give one yesterday”, going so far as to post a screenshot of email correspondence. O’Brien then continues with his reflections on the parlous state of Irish media finances, noting “a very challenging environment” and that the Irish Times is “considering various funding options”, before predicting that “some media companies will not survive this decade without radical restructuring”. He then closes by returning to the theme of “Sinn Féin/IRA” funding, closing with the hope that perhaps the political party will at some point get into the business of becoming a “fully-fledged broadcaster and publisher and create some jobs for a change”. Sunday Times writer Mark Tighe was the first to point out that the Irish Independent report on the statement amended this to simply “Sinn Féin”. 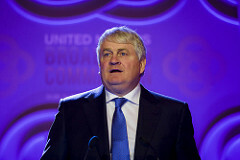 On the Sunday following O’Brien’s midweek broadside, Sunday Independent writers did not mention the affair, except for Shane Coleman, who wrote a column pooh-poohing the idea that Denis O’Brien has an over-weening influence, because everybody is reading blogs and watching youtube as part of their varied media diet. In a bizarro twist, the result of O’Brien’s response to the Boylan sponsored report may see the billionaire, so long the plaintiff, on the other side in a defamation hearing. This entry was posted in Social & Cultural and tagged An Phoblacht, Colm Keaveney, Communicorp, Denis Naughten, Denis O'Brien, european Parliament, Fintan O'Toole, Guardian, Independent News & Media, Irish Independent, James Morrissey, Kevin Bakhurst, Liam Collins, Lynn Boylan, Mark Tighe, Roy Greeslade, RTÉ, Shane Coleman, Sinn Féin, Sunday Business Post, Sunday Independent, Sunday Times. Bookmark the permalink.